MX AA NiMH Batteries (8-Pack, 1.2V, 2550mAh) is rated 4.8 out of 5 by 28. Rated 5 out of 5 by Robert from Great Recycling Time! I haven't used my Nikon SB-900 in quite some time. The last time I used it for an event, I was using different batteries than the ones I chose this time. A few years ago, I bought some Sony "Stamina Plus" alkaline batteries in bulk. I figured why not use them in my SB-900. Terrible idea!!! I found out very quickly that those batteries were NOT good enough to shoot an event. The recycle time was terrible and I ended up missing a lot of shots. Fast forward to these Watson MXs. I tested them immediately, straight out of the package (since they are pre-charged). I must say I am definitely impressed. The recycle time, even on high power is amazing. I would definitely recommend this purchase. Rated 5 out of 5 by Wayne from Lasting Power These batteries are great for powering devices such as electronic flash units, portable radios, etc. I especially appreciate their ability to be able to maintain 85% charge for as long as a full year. Other rechargeable batteries that I have used have been a pain due to the fact that before using them I always had to check the remaining power... or, to be certain not to be left with a failing flash unit, power them up again before each use. Love the 2550mAh high capacity and long-lasting shelf life of these babies! Rated 3 out of 5 by Wesley from Discharge rate is higher than eneloops. Had a relatively high initial charge but when operating the same camera type they discharge faster than the eneloop pros (in a trailcam). But they are significantly cheaper. Rated 5 out of 5 by Pete from Definitely recommend, reliable! This is my third set - I use them mostly in speed lights (Yongnuo 360 IV). Have tried some others, but stick to these, always reliable and good life. If youre new to these: Be aware that when youve been using them in a flash and its time to change them out, they will be HOT to the touch, so dont drop them into your open palm or handle them with bare fingers, itll leave a mark. Yes, I found this out the hard way. Does not seem to be a flaw or affect performance. Rated 5 out of 5 by Michael from Still solid a year later I bought these back in August 2017. I use them nearly every weekend of my life as a full time wedding photographer. One of my flash heads is backed up by a Quantum Turbo 3, but one is not. I can go hours firing away at -2/3 with these batteries and they just last and last. This is a *much* more economical and environmentally friendly alternative to AA batteries. 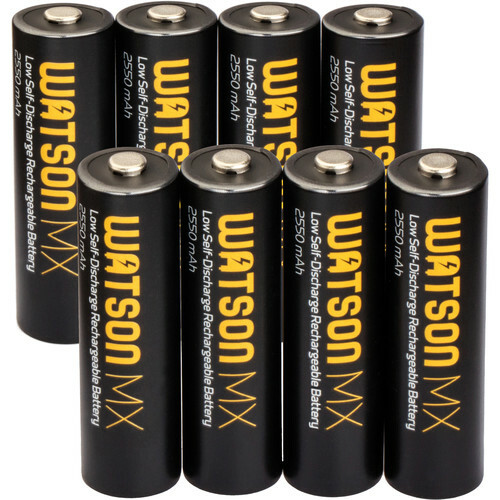 I am very happy with this upgraded version of the Watson rechargeable batteries! Rated 5 out of 5 by Ronald from New to Rechargeables Being new to using Rechargeable Batteries I’m very happy working with the Watson MX AA NiMH. I’ll keep this simple. I charge the MX AA, put 4 in my speed-light or 12 in my Bolt Battery Pack, shoot the job and I have yet to have any issue with battery power lasting or recycling time on my shoots. Nothing to complain about here. I'm done with looking for AA Alkalines on sale. Rated 5 out of 5 by Louis from You won't know the difference. I've been using Watson chargers and battery packs for years. Like ALL rechargeable some last longer than others. Thankfully Watson has upped its game and these do appear to hold their charge longer. Always nice to see any company not matter how small the product take the time to improve it. Way to go Watson. Rated 5 out of 5 by Christopher from So far so good So far, so good. I've been using the smaller capacity (blue) batteries by these guys for a year or so and when the larger ones came out, getting some seemed like a no brainer. They've always worked great and so far these ones do to. Great product. Will this battery work with pearstone rapid charger? These batteries work with Watson 4-Hour Rapid Charger for AA and AAA NiMH and NiCd Rechargeable Batteries ? Asked by: BOLIVAR A. R.
How well do these batteries function in very hot humid weather? Do they ever swell up? I have the Watson rapid charger, but I'm pretty sure the batteries will work with any AA charger.